Care of Kevin Brennan's blog I found another article talking about the differece between the PM and BA role and why on any reasonable sized project it is important to have the roles separated. The role also expands on the idea of the IIBA and PMIs contributions to improved project performance. The basic idea is, as usual; skilled, experienced and qualified people go further that methodologies and tools in ensuring good results from projects. 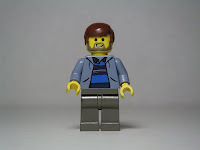 (and is part of a series on Lego CEOs). 1. Craig, you are way too prolific a writer. And you are far too talented a writer to be making project plans. I hope you get the chance to push it a little? 2. BA v PM is a pet peeve of mine. While I agree that in larger projects they should be distinct roles, this is only because of time. Show me a PM who is unfamiliar with the BA's work, and I will show you a pencil-pusher and theorist. At least, that's how I feel today. Tomorrow I may change my mind. My mind has iterations of belief. Josh you sound like an "Agilista" propounding the benefits of generalists. I guess much of my work is on largish enterprise projects where the work is segregated. I admit that on smaller projects and in smaller businesses you simply have to roll the roles into one. You grabbed me with the tag line - shame I am required to log in. The PM is a person who sees across the landscape. The BA drills the wells.